Money for Teachers | Diary of a Public School Teacher! In Defense of the Teacher’s Union! My Union is OK with Me! “WeAreTeachers” Wants to GIVE Teachers Money! Check out this wonderful site. You will definitely find something you need! What a great idea! I discovered them earlier this year and I love this organization. Someone said to themselves(or a group of people, who knows? 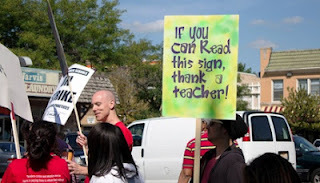 ), what can I do to make it easier for teachers to get money for all the wonderful things they do? How can I provide them with the funds they need without any out-of pocket expense? How can I help those, who want to help teachers, find teachers in need? I know, I’ll create a site where donors can choose what project they want to fund! At least, that’s my version of what happened. 🙂 But, this is what they do. All you have to do is have a project in mind, go to their website, put in the asked for information, and ” Voila!” Okay, not everyone gets funded, but at least you stand a fighting chance. I needed 30 headphones and mouse pads for the wireless laptops my school received. I posted on DonorsChoose.org and, no kidding, within a month I had funding for 30 mouse pads and 30 headphones. One of our donors was students who wanted to give to others! Also, I almost didn’t get my headphones because of a mix-up. I wrote to Donors, they stepped in, and I received 30 headphones. Edmodo, in correlation with Discovery Education has stepped in and have a page that publishes teachers’ projects, all you have to do is email them your project information. I have another project on Donors, I want wireless mice to use with the Office Mouse Mischief program, which I hope gets funded. But even if it isn’t, Donors has given me a chance to get what I need for my classroom, with no out-of-pocket expense!